Once again, Geneva proved the perfect host for the first major European motor show of the year. It's literally been exhausting keeping track of the new and recently-launched cars to debut at the show, but despite the sore feet, aching fingers and nagging headache, Geneva 2014 has been utterly enthralling. And just for once, the big story hasn't been about super and hypercars that most of us will only see being abused on Top Gear, but the cars that had everyone talking in 2014 were small, and perfectly formed. You can see why the car manufacturers make the trek to show off their wares. Geneva is centrally located, and within easy reach of the UK, France, Germany, Italy and Spain. From a journalist's stand point, it's within walking distance of Geneva airport, meaning you can fly in, get the stories, and fly out again - all in one day. But most importantly, enthusiasts and actual car buyers can see the cars they're actually going to actually buy, with their own money. Not just dream fodder. Perhaps that's why Renault chose to show the Twingo III. And that why Joint Venture partners, Peugeot, Citroen and Toyota carted out their variations on the baby car theme, the new 108, C1 and Aygo. All four babies are well established - the Renault Twingo was launched in 1993, and was a trend-setter from day one. The first one was a mono-box with cute styling, and as the years passed, Renault cottoned on to its baby being pretty classless, and so added luxuries, such as air conditioning and leather upholstery. Today, it's already venerated as a design classic. The Twingo II was less of a step forward, and that's where the 2005 Citroen C1/Peugeot 107/Toyota Aygo came in. The trio of cheap hatchbacks were small, basic, and powered by a willing little three-pot that spurred the driver on to driving in a big-car manner. The post-2008 world of recession and high fuel costs have been perfect for the CitPeuToy triplets - and sales remained strong, and residuals, even stronger. It was a car perfectly in-tune with the European desire to downsize, and lessen running costs. Much of the Twingo's appeal lies in the fact that it's just different. And it's a sign that after decades of automotive orthodoxy, manufacturers are really pushing the envelope of small car design again. 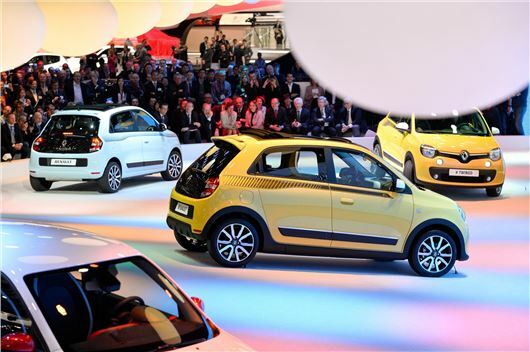 So to see the new Twingo and CitPeuToy launched at the same event shows just how seriously the major players are taking our re-ingited love affair with small cars. The C1, 108 and Aygo certainly look like a major step forward for their makers, and it's nice to see some genuine styling flair being applied in an attempt to differentiate them. The Peugeot looks almost elegant, the Citroen's wacky, and the Toyota's X-nose is visually arresting. But interesting as the CitPeuToy trio is, they're pretty much their makers' Twingo II moment. They'd have looked superb in isolation had it not been for the arrival of the Twingo III. So why do I feel a sense of excitement that we're about to be offered a rear-engined baby car for the first time since the Fiat 126BIS was phased out in 1989? The game's moved on - the engine will be light, it looks compact, while its handling will be managed by modern suspension technology - with none of those wet weather wobbles that Beetle owners would be familiar with. The Twingo will undoubtedly get a EuroNCAP five-star rating, and will do so without the truck-like nose that modern small cars need in order to pass crash and pedestrian impact tests. But more than that - it's just different. And a sign that after decades of automotive orthodoxy, manufacturers are really pushing the envelope of design again. And there's another hugely important factor in the Twingo III's favour - it just looks cool, and pretty much everyone who saw it at Geneva thought the same. Its odd cab-forward proportions will soon look normal once the car's familiar on the streets.